Selfie taken by NASA's Curiosity rover on Mars. A big methane spike that NASA's Mars rover Curiosity detected two years ago was not due to seasonal changes on the Red Planet, NASA scientists said. For a few weeks in late 2013 and early 2014, Curiosity noticed that atmospheric methane — a gas that could possibly be an indication of microbial activity — surged from an average background level of about 0.7 parts per billion all the way up to 7 parts per billion. "It was an episodic release, still unexplained," NASA officials said of the methane surge. "However, the rover's measurements do suggest that much subtler changes in the background methane concentration — amounts much less than during the spike — may follow a seasonal pattern." This diagram shows possible ways that methane might make it into Mars' atmosphere (sources) and disappear from the atmosphere (sinks). Both Earth and Mars have similar tilts, which give both planets seasons. Mars sees more extremes, however, particularly in terms of daily temperatures, which can be above freezing during the day but then plunge to minus 130 degrees Fahrenheit (minus 90 degrees Celsius) at night due to the planet's thin atmosphere. Curiosity landed inside Mars' 96-mile-wide (154 kilometers) Gale Crater on Aug. 5, 2012. Mars circles the sun once every 687 Earth days, or 668.6 "sols" (Martian days; a sol is 39.6 minutes longer than an Earth day). NASA's Curiosity rover has completed two Martian years on the Red Planet, documenting seasonal patterns at its Gale Crater home since landing in 2012. 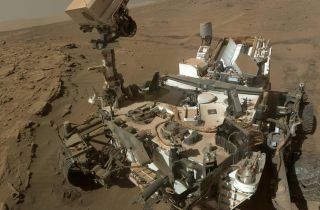 Wednesday (May 11) was Curiosity's 1,337th sol on Mars, marking the start of the rover's third Red Planet year. The rover has therefore experienced two full seasonal cycles on Mars, which is why mission team members are able to start drawing some conclusions or inferences about seasonal patterns. While Curiosity's main task is assessing Gale Crater's past and present ability to support microbial life, the rover has also been taking periodic measurements of environmental parameters such as temperature, pressure and ultraviolet light. These long-term observations help scientists better understand how the climate of Mars behaves today. Such data also serve as a comparison against the wetter weather of the Martian past, which NASA is learning about through other missions such as MAVEN (Mars Atmosphere and Volatile Evolution) and the Mars Reconnaissance Orbiter. "Mars is much drier than our planet, and in particular Gale Crater, near the equator, is a very dry place on Mars," Germán Martínez, a Curiosity science team collaborator at the University of Michigan, said in the same statement. "The water vapor content is a thousand to 10 thousand times less than on Earth." Curiosity's Rover Environmental Monitoring Station (REMS) has seen air temperatures varying from 60.5 degrees Fahrenheit (15.9 degrees Celsius) on a summer day to minus 148 Fahrenheit (minus 100 Celsius) on a winter night. Atmosphere water content increases during the warmer months, and relative humidity is higher in the colder months, NASA officials said. There are also regular cycles in atmospheric pressure, which hits a low in the winter and a high in the spring. This is due to the seasonal polar caps releasing huge amounts of carbon dioxide in the spring, after the carbon dioxide freezes out of the atmosphere in the winter, researchers said.